"A sweet, tart, crunchy side dish that is especially nice in the fall." 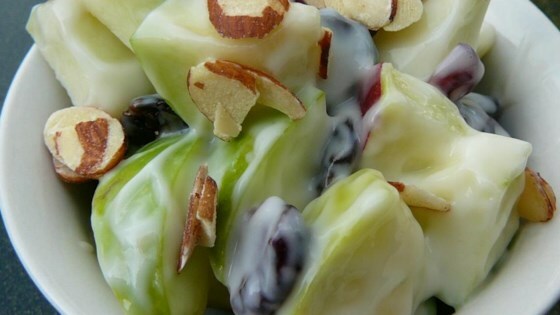 In a medium bowl, stir together the apples, almonds, cranberries, cherries and yogurt until evenly coated. This simple salad is tart, sweet, crisp, and refreshing. I made this for Thanksgiving and it was just OK. It wasn't very exciting. I like all the ingredients, but it didn't do it for the group. I probably won't make it again. We served this wonderful salad for a baby shower. We wanted to serve new and differant foods and found this and I am glad we did, everyone loved it and asked for the recipe. I love this salad. I split the quantity of yogurt in half and added vanilla pudding. Yum. This was pretty good. I used red delicious apples and craisins in it. I will probably make this again.